Scroll below for a full list of our community involvement, organized by category and date. March 21, 2019: Poetry and Art at the JCC inspired by the exhibit "Crossed Paths" by Melenie Fleischer, Michael Shumiatcher, Eric Wilson, a group of Dene Artists. Presented by Pandora’s Collective, the Sidney and Gertrude Zack Gallery and the Isaac Waldman Jewish Public Library. Made possible by the Yosef Wosk Poetry Initiative Grant. Feb 21, 2019: Poetry and Art at the JCC inspired by the exhibit In Partnership with Nature by Sidi Schaffer. Presented by Pandora’s Collective, the Sidney and Gertrude Zack Gallery and the Isaac Waldman Jewish Public Library. Made possible by the Yosef Wosk Poetry Initiative Grant. January 22, 2019: Poetic Pairings presented by Pandora’s Collective and Britannia Library, Vancouver, BC. Dec 6, 2018: Poetry and Art at the JCC, inspired by the exhibit Heart to Heart by Claudie Azoulai and Nicole Schouela. Presented by Pandora’s Collective, the Sidney and Gertrude Zack Gallery and the Isaac Waldman Jewish Public Library. Made possible by the Yosef Wosk Poetry Initiative Grant. Dec 5, 2018: Pandora's Collective Presented Twisted Poets Literary Salon Heartwood Anthology Launch and Fundraiser. Hood 29, Vancouver. Nov 1, 2018: Poetry and Art at the JCC inspired by the exhibit Heart to Heart by Claudie Azoulai and Nicole Schouela. Presented by Pandora’s Collective, the Sidney and Gertrude Zack Gallery and the Isaac Waldman Jewish Public Library. Made possible by the Yosef Wosk Poetry Initiative Grant. October 30, 2018: Poetic Pairings Presented by Pandora’s Collective and Britannia Library, Vancouver. October 28, 2018: Bowen Island - Book Launch. Bonnie Nish and Jude Neale’s "Cantata in Two Voices" (Ekstasis Editions) presented by Pandora's Collective. Bowen Island. Oct 21, 2018: Book Launch; Bonnie Nish and Jude Neale’s Cantata in Two Voices (Ekstasis Editions) Presented by Pandora's Collective. Vancouver. 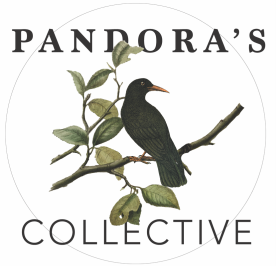 Sept 30, 2018: Pandora's Collective info table at Word Vancouver. Pandora’s Collective, the Sidney and Gertrude Zack Gallery and the Isaac Waldman Jewish Public Library. Made possible by the Yosef Wosk Poetry Initiative Grant. July 24, 2018: Poetic Pairings presented by Pandora’s Collective and Britannia Library, Vancouver, BC. May 3, 2018: Pandora’s Collective, the Sidney and Gertrude Zack Gallery and the Isaac Waldman Jewish Public Library Present Word Whips in the Gallery Poetry & Art inspired by the exhibit 'Painting Intimate' by Penny Eisenberg and Ray Ophoff. This event was made possible by the Yosef Wosk Poetry Initiative Grant. March 21, 2018: Word Whips by the Sea presented Pandora’s Collective. The Silk Purse, West Vancouver. Mar 15, 2018: Word Whips in the Gallery inspired by the exhibit: I See Music by Ava Lee Millman Fisher. Presented by Pandora's Collective the Sidney and Gertrude Zack Gallery and the Isaac Waldman Jewish Public Library. Made possible by the Yosef Wosk Poetry Initiative Grant. March 14, 2018: Panel 2, "Influencies" presented by Pandora’s Collective and Britannia Library, Vancouver. Feb. 21, 2018: Panel 1, Writing Across Genres, presented by Pandora’s Collective and Britannia Library. Feb 8, 2018: Word Whips in the Gallery inspired by the exhibit: Dressed in Colour by artist Lauren Morris. Presented by Pandora’s Collective in collaboration with Sidney and Gertrude Zack Gallery and the Isaac Waldman Jewish Public Library. Made possible by the Yosef Wosk Poetry Initiative Grant. Jan 23, 2018: Poetic Pairings presented by Pandora’s Collective and Britannia Library. by Artist Dina Goldstein. Presented by the Sidney and Gertrude Zack Gallery in collaboration with Pandora’s Collective and the Isaac Waldman Jewish Public Library. Made possible by the Yosef Wosk Poetry Initiative Grant. Dec 5, 2017: WORD WHIPS IN THE GALLERY inspired by the exhibit Light within the Shadows by artist Pnina Granirer.​ Presented by the Sidney and Gertrude Zack Gallery in collaboration with Pandora’s Collective and the Isaac Waldman Jewish Public Library. Made possible by the Yosef Wosk Poetry Initiative Grant. Oct 24, 2017: Carmen Aguirre - Author Reading and Q&A, Presented by Pandora's Collective and Britannia Branch. Sponsored by the Telus. Oct 18, 2017: Pandora’s Collective and Isaac Waldman Jewish Public Library Present Concussion and Mild Brain Injury: Not Just Another Headline Reading and Q & A.
Sep 25, 2017: Pandora's Collective and the Zack Gallery Present Word Whips in the Gallery, Inspired by the exhibit Retrospective by Waldemar Smolarek. Presented by the Sidney and Gertrude Zack Gallery in collaboration with Pandora’s Collective and the Isaac Waldman Jewish Public Library. Made possible by the Yosef Wosk Poetry Initiative Grant. Sept 19, 2017: Poetic Pairings presented by Pandora's Collective and Britannia Branch In Conjunction with Word Vancouver Festival, Britannia Library, Vancouver. Aug 17, 2017: Pandora's Collective and the Nina Di Gallery Present Word Whips - Poetry to Picnic. Locations: Nina Di Gallery, 1740 Charles St, Vancouver and Grandview Park, 1657 Charles St, Vancouver. Aug 15, 2017: Pandora's Collective presents Word Whips in the Gordon Smith Gallery inspired by the exhibit Art School High. Gordon Smith Gallery North Vancouver. July 12, 2017: Word Whips in The Gallery inspired by the Exhibit: Sea to Sky: Michael Ableman | Victoria Scudamore. Presented by the Sidney and Gertrude Zack Gallery in collaboration with Pandora’s Collective and the Isaac Waldman Jewish Public Library. Made possible by the Yosef Wosk Poetry Initiative Grant. June 15, 2017: Pandora's Collective and the Vancouver Public Library Present Concussion and Mild Brain Injury: Not Just Another Headline The Readings. June 14, 2017: Word Whips in The Gallery inspired by the Exhibit Physician Heal Thyself...and Others. Presented by the Sidney and Gertrude Zack Gallery in collaboration with Pandora’s Collective and the Isaac Waldman Jewish Public Library. Made possible by the Yosef Wosk Poetry Initiative Grant. May 16, 2017: Pandora's Collective and the Vancouver Public Library Present, Concussion and Mild Brain Injury: Not Just Another Headline The Readings. April 20, 2017: Pandora's Collective Presents "Three Score and Ten: Time to Celebrate!" a reading sponsored by the League of Canadian Poets and The Canada Arts Council. Historic Joy Kogawa House, Vancouver. April 19, 2017: Word Whips in The Gallery inspired by the exhibit Eye Lines by Judi Angel. ​Presented by the Sidney and Gertrude Zack Gallery in collaboration with Pandora’s Collective and the Isaac Waldman Jewish Public Library. Made possible by the Yosef Wosk Poetry Initiative Grant. April 12, 2017: Concussion and Mild Brain Injury: Not Just Another Headline The Readings, Britannia Library. March 21, 2017: Poetic Pairings 7 presented by Pandora’s Collective and Britannia Library. March 15, 2017: Word Whips in The Gallery inspired by the Exhibit:The Intersection of Science & Art by Joanne Emerman and Mike Cohene. ​Presented by the Sidney and Gertrude Zack Gallery in collaboration with Pandora’s Collective and the Isaac Waldman Jewish Public Library. Made possible by the Yosef Wosk Poetry Initiative Grant. Feb 8, 2017: Word Whips in The Gallery inspired by the art of Jack Rootman. Presented by the Sidney and Gertrude Zack Gallery in collaboration with Pandora’s Collective and the Isaac Waldman Jewish Public Library. Made possible by the Yosef Wosk Poetry Initiative Grant. Jan 5, 2017: Word Whips in The Gallery inspired by Urban art photos by Sharon Tenenbaum. Presented by the Sidney and Gertrude Zack Gallery in collaboration with Pandora’s Collective and the Isaac Waldman Jewish Public Library. Made possible by the Yosef Wosk Poetry Initiative Grant. (Monthly) Twisted Poets, Word Whips Writing Series, Word Whips North Shore Edition, Word Whips By The Water and Book Talks Book Club. Nov 17, 2016: Word Whips in The Gallery: Music, Art, Poetry & Dance inspired by the exhibit, Simplicity by Ivor Levin. Presented by the Sidney and Gertrude Zack Gallery in collaboration with Pandora’s Collective and the Isaac Waldman Jewish Public Library. Made possible by the Yosef Wosk Poetry Initiative Grant. Oct 22, 2016: Words that Sing: Call and Response, an evening of Music and Poetry presented by Pandora’s Collective and The Lyric Singers. Delta Firehall For the Arts. Oct 20, 2016: Word Whips in The Gallery; Music, Art, Poetry & Dance inspired by the exhibit, "Marc Chagall’s Bible Suites". Presented by the Sidney and Gertrude Zack Gallery in collaboration with Pandora’s Collective and the Isaac Waldman Jewish Public Library. Made possible by the Yosef Wosk Poetry Initiative Grant. June 16, 2016/06: Word Whips in the Gallery To accompany the exhibit “Berlin Identities” by Ira Hoffecker. Presented by the Sidney and Gertrude Zack Gallery in collaboration with Pandora’s Collective and the Isaac Waldman Jewish Public Library. Made possible by the Yosef Wosk Poetry Initiative Grant. June 14th 2016: Pandora’s Collective and Britannia Library Present Poetic Pairings 5, Britannia Library. April 18, 2016: Word Whips in the Gallery, to accompany the art exhibit “The Plagues” by Robin Atlas and Nancy Current. Presented by the Sidney and Gertrude Zack Gallery in collaboration with Pandora’s Collective and the Isaac Waldman Jewish Public Library. Made possible by the Yosef Wosk Poetry Initiative Grant. March 29, 2016: Word Whips in the Gallery, to accompany “Winter Paintings: the Figure in and on the Landscape” by Ian Penn. Presented by the Sidney and Gertrude Zack Gallery in collaboration with Pandora’s Collective and the Isaac Waldman Jewish Public Library. Made possible by the Yosef Wosk Poetry Initiative Grant. March 1, 2016: Word Whips in the Gallery, to accompany the exhibit "Hidden" by Olga Campbell and Larry Green, Presented by the Sidney and Gertrude Zack Gallery in collaboration with Pandora’s Collective and the Isaac Waldman Jewish Public Library. Made possible by the Yosef Wosk Poetry Initiative Grant. Feb 9, 2016: Pandora’s Collective and Britannia Library Present Poetic Pairings 4. Dec 1, 2015: Pandora's Collective, The Sidney and Gertrude Zack Gallery and the Isaac Waldman Jewish Public Library Present Word Whips in the Gallery, To accompany the art exhibit, “Storm Brewing” by Shevy Levy. Nov16, 2015: Pandora’s Collective and Leaf Press Present An evening of Releases. ChapBook Launch for Marilyn Bowering and Chelsea Comeau. Oct 27, 2015: Pandora's Collective, The Sidney and Gertrude Zack Gallery and the Isaac Waldman Jewish Public Library Present Word Whips in the Gallery to accompany the art exhibit “Urban Forest” by Lori Goldberg. Oct 6th, 2015: Pandora’s Collective and Britannia Library Present, Poetic Pairings 3. Oct 7, 2015: Pandora’s Collective Presents a Y’s Books Literary Evening. Sept 17, 2015: Word Whips in the Gallery, Inspired by the art of Ian Penn, Presented by The Sidney and Gertrude Zack Gallery, Pandora’s Collective and The Isaac Waldman Jewish Public Library. July 29, 2015: Pandora’s Collective present Words On Water, Lonsdale Quay Public Market. June 24, 2015: Pandora's Collective and CV2 Present, A Night of 48 Hour Poems, Vancouver. April 25, 2015: Sponsor, Great Canadian PoeTrain Vancouver Show. March 24, 2015: Word Whips in the Gallery, Inspired by “A Tapestry of Flowers” by Lauren Morris, Presented by The Sidney and Gertrude Zack Gallery, Pandora’s Collective and The Isaac Waldman Jewish Public Library. Jan 20, 2015: Word Whips in the Gallery: A Night of Poetry, Art and Dance, Inspired by “New Work from the Road” by Derek Gillingham, Presented by The Sidney and Gertrude Zack Gallery, Pandora’s Collective and The Isaac Waldman Jewish Public Library. October 5, 2014: Pandora’s Collective, Mother Tongue Publishing and The Writers Union of Canada present A Book Launch of Cathy Ford and Julia Leggett. Sept 16, 2014: Word Whips at the JCC, Poetry by Pandora’s Collective inspired by the photography exhibit "Traces" by Michael Seelig. Presented by The Sidney and Gertrude Zack Gallery, Pandora’s Collective and The Isaac Waldman Jewish Public Library. June 13, 2014: Pandora’s Collective and CV2 Present the CV2 2 Day Poetry Contest Readings at The Toast Collective, Vancouver BC. May 23, 2014: Pandora’s Collective Presents Confessions The Artwork, The Words and a Wordwhip: An evening of music, poetry and art inspired by the Confessions exhibit by Vancouver artist Jamie Smith. May 15, 2014: Word Whips at the JCC, Poetry by Pandora’s Collective inspired by the art exhibit "Envisioning Women". Presented by The Sidney and Gertrude Zack Gallery, Pandora’s Collective and The Isaac Waldman Jewish Public Library. April 17, 2014: Pandora’s Collective Present authors Nish and Neale, Vancouver Public Library. March 25, 2014: Pandora’s Collective Presents Jude Neale: A Quiet Coming of Light Book Launch, The Cottage Bistro, Vancouver. March 6, 2014: Word Whips at the JCC, Poetry by Pandora’s Collective inspired by BRUSH AND WIRE, an exhibit by KAREN BRUMELLE and JOANNE WATERS. Presented by The Sidney and Gertrude Zack Gallery, Pandora’s Collective and The Isaac Waldman Jewish Public Library. Jan 9, 2014: Word Whips at the JCC, Poetry by Pandora’s Collective inspired by the art of ALICE RABINOWITZ. Presented by The Sidney and Gertrude Zack Gallery, Pandora’s Collective and The Isaac Waldman Jewish Public Library. (Monthly) Twisted Poets, Word Whips Writing Series, Word Whips North Shore Edition, Word Whips By The Water, Book Talks Book Club. Dec 5, 2013: Word Whips at the JCC, Poetry by Pandora’s Collective inspired by STORY/LINE, an exhibit of photography by LARRY WOLFSON. Presented by The Sidney and Gertrude Zack Gallery, Pandora’s Collective and The Isaac Waldman Jewish Public Library. Oct 22, 2013: Word Whips at the JCC, Music by Harriet Frost. Poetry by Pandora’s Collective. Arty by Jazmin Sasky. Presented by The Sidney and Gertrude Zack Gallery, Pandora’s Collective and The Isaac Waldman Jewish Public Library. Oct 3, 2013: Word Whips at the JCC, Music by Myrna Rabinowitz. Poetry by Pandora’s Collective. Art by Darcy Mann. Presented by The Sidney and Gertrude Zack Gallery, Pandora’s Collective and The Isaac Waldman Jewish Public Library. June 20, 2013: Word Whips inspired by Lori Goldberg's art exhibit, Into the Garden, Presented by The Sidney and Gertrude Zack Gallery, Pandora’s Collective and The Isaac Waldman Jewish Public Library. March 21, 2013: Glimpses of Africa. Music, Poetry & Word Whips inspired by photographs by Claudine Pommier. Presented by The Sidney and Gertrude Zack Gallery, Pandora’s Collective and The Isaac Waldman Jewish Public Library. Jan 24, 2013: Music, Poetry & Word Whips inspired by Your People are My People, Presented by The Sidney and Gertrude Zack Gallery, Pandora’s Collective and The Isaac Waldman Jewish Public Library. Sept 27, 2012: Word Whip inspired by art exhibit Rain by Nomi Kaplan, Presented by The Sidney and Gertrude Zack Gallery, Pandora’s Collective and The Isaac Waldman Jewish Public Library. May 29, 2012: Word Whip: Celebrating Jerusalem group art exhibit, Presented by The Sidney and Gertrude Zack Gallery, Pandora’s Collective and The Isaac Waldman Jewish Public Library. April 10, 2012: Word Whip: Tikun Olom photography exhibit by Judi Angel, Presented by The Sidney and Gertrude Zack Gallery, Pandora’s Collective and The Isaac Waldman Jewish Public Library. March 13, 2012: Word Whip: Poetry inspired by the contemporary felt art exhibit “Feltworks”, Presented by The Sidney and Gertrude Zack Gallery, Pandora’s Collective and The Isaac Waldman Jewish Public Library. Feb 16, 2012: Pandora's Collective 10th Anniversary Celebration, The Prop House, Vancouver BC. Feb 4, 2012: Canada's Best Poetry 2011, Vancouver Edition, presented by Books on the Radio, Pandora's Collective and Tightrope Books, W2 Media Cafe, Vancouver BC. Jan 26, 2012: An Evening of Poetry and Art, Presented by The Sidney and Gertrude Zack Gallery, Pandora’s Collective and The Isaac Waldman Jewish Public Library. (Monthly) Twisted Poets, Word Whips Writing Series, Word Whips North Shore Edition, Word Whips By The Water, Book Talks Book Club, Book Talks White Rock. May 8th, 2011: Word Whips: Inspired by “Go Figure!”, Exhibitor: Robyn Michele Levy, Presented by The Sidney and Gertrude Zack Gallery, Pandora’s Collective and The Isaac Waldman Jewish Public Library. March 3rd, 2011: Word Whips: An Evening of Music and Poetry, Presented by The Sidney and Gertrude Zack Gallery, Pandora’s Collective and The Isaac Waldman Jewish Public Library. Feb 6, 2011: Word Whips: Inspired by Kumra, My Child, Presented by The Sidney and Gertrude Zack Gallery, Pandora’s Collective and The Isaac Waldman Jewish Public Library. Jan 9, 2011: Word Whips: Inspired by “out of the silence”, Presented by The Sidney and Gertrude Zack Gallery, Pandora’s Collective and The Isaac Waldman Jewish Public Library. Sept 2010: Pandora’s Collective at Word on the Street, featuring Twisted Poets Literary Salon with Bonnie Nish, Fran Bourassa, Daniela Elza, Warren Dean Fulton, David Shewell. June 24, 2010: Word Whips: Inspired by “Child Out of Time” Exhibitor: Janet Strayer, Presented by The Sidney and Gertrude Zack Gallery, Pandora’s Collective and The Isaac Waldman Jewish Public Library. June 6th, 2010: Pandora’s Collective presents a ‘Poetry Picnic’ Fundraiser, Featured Readers: Sandy Shreve & Shannon Rayne. April 24, 2010: Pandora’s Collective Workshop Readings. April 20th, 2010: Word Whips: Alley Ways: The Hidden Places Uncovered, Exhibitors: Norm Chodirker and Jeanne Krabbendam, Presented by The Sidney and Gertrude Zack Gallery, Pandora’s Collective and The Isaac Waldman Jewish Public Library. (Monthly) Twisted Poets, Word Whips Writing Series and Word Whips North Shore Edition. Dec 2009: Guest Judge for the Little Flower Academy, Falling Into Words writing contest. Nov 12, 2009: "Whip Up The Words", an evening of poetry and photography, brought to you by Cherie Smith Jewish Book Festival, Isaac Waldman Jewish Public Library, The Sidney and Gertrude Zack Gallery and Pandora's Collective. Oct 2009: Hosted CWILL BC's "Fall Book Harvest", The Vancouver Public Library. 2009: Hosted CWILL BC's "Spring Book Hatching", The Vancouver Public Library. Feb 19, 2009: Hosted, an art and poetry collaboration event featuring Pandora's Collective poets, Word Whips Writing Series and the art of Assia Linkovsky. Sidney and Gertrude Zack Gallery, Jewish Community Centre of Greater Vancouver. (Monthly) Twisted Poets, Word Whips Writing Series, Upstart Crow and Word Whips North Shore Edition. Oct 5, 2008: Hosted CWILL BC's "Fall Book Harvest", The Vancouver Public Library. Feb 2008 - June 2008: Voices Vancouver (1/month). June 14, 2008: Hosted CWILL BC's "Spring Book Hatching", The Vancouver Public Library. ​(Monthly) Twisted Poets, Word Whips Writing Series, Upstart Crow and Word Whips North Shore Edition. June 9th 2007: Hosted "The Spring Book Hatching", sponsored jointly by CWILL BC, Blackberry Books, The Vancouver Public Library and Pandora’s Collective, VPL. Aug 1, 2006: Hosted a tribute to the late Shulamit Joffre, First Tuesday Assembly of Poets, Chapters, Robson Street. June 6, 2006: Guest hosts for First Tuesday Assembly of Poets, Chapters, Robson Street. May 6, 2006: Info table at the Vancouver Public Library's Community Day. May 2, 2006: Guest hosts for First Tuesday Assembly of Poets, Chapters, Robson Street. January 8, 2006: Guest speakers @ Urban Writers, Vancouver BC. October 4, 2005: Guest hosts for First Tuesday Assembly of Poets, Chapters, Robson Street. August 26, 2005: Pandora's Collective Roving Poetry Troupe, as a part of Art Days at VanDusen Botanical Garden. July 8-10, 2005: Info table at The West Coast Poetry Festival. Summer Issue 2005: Guest Editors for Quills Canadian Poetry Magazine. June 7, 2005: Guest hosts for First Tuesday Assembly of Poets, Chapters, Robson Street. May 23, 2005: Info table at the Vancouver Poetry Slam Finals, Vancouver Heritage Hall. 2004 - 2003: Under the Elephant open mic, every 2nd Tuesday of the month, at Tigers restaurant. Nov. 19th, 20th & 21st, 2004: Studio 330 Poetry Readings, as a part of the East Side Culture Crawl. Oct 22-24, 2004: Info table at the Surrey International Writers Conference. August 7, 2004: The Poet's Corner at the Roundhouse Community Centre. April 30 - May 2, 2004: Pandora's Collective Poetry Troop as a part of Parker Presents. March 15, 2004: Interviewed Josh Byer for Bolts of Fiction. Oct 16 – 19, 2003: Pandora’s Collective info table @ Surrey International Writers Conference. ​(Monthly) Twisted Poets Literary Salon, Vancouver BC. ​March 24, 2018: Expressive Arts Workshop: Rising into Spring presented by Pandora’s Collective. Feb 17, 2018: Identity Collage Workshop: Bridging the Gaps, presented by Pandora’s Collective and Britannia Library. August 28, 2017: Pandora's Collective Presents: Expressive Arts Workshop "Transitioning Into Fall", Vancouver, BC. June 7, 2017: Identity Collage Workshop: Bridging the Gaps. Presented by Pandora’s Collective and the Isaac Waldman Jewish Public Library. Sponsored by Telus. February 12, 2017: Mask Making Expressive Arts Workshop presented by Pandora's Collective. Feb 5, 2017: Pandora’s Collective and Isaac Waldman Jewish Public Library Present, Identity Collage: Places of Origin /Places of Residency Workshop. July 12, 2016: Hastings Branch Library and Pandora’s Collective Present Identity Collage: Places of Origin /Places of Residency A Workshop, Reading and Open Mic. May 10, 2016: Pandora’s Collective and Hastings Branch Library Present Found Poetry and Other Things. A Workshop, Reading and Open Mic. May 3, 2016: Pandora's Collective and South Hill Library present Dragons and Other Night Time Imaginings. A workshop, reading and open mic. Aug 16, 2015: Pandora’s Collective present A Poetry Workshop at Starbucks. May 31, 2015: Pandora's Collective and Starbucks present a special evening: Writing About Place, Vancouver BC. February 28 2010: Soulful Expressions-Vancouver Artists Collective Workshop: Path to Poetry with Bonnie Nish. February 21, 2010; Poetry Chapbook Making Workshop with Warren Dean Fulton. Aug 29, 2009: Summer Dream Literary Arts Festival Workshops. April 8, 2008: Young Writers Festival, Roundhouse Community Centre, Vancouver BC. May 16, 2007: Guest instructors, Prompting the Muse with Ruth Kozak, Kitsilano Highschool, Vancouver BC. March 3, 2007: Guildford Library (for teens), Surrey BC. Nov 22, 2006: Guest instructors, Prompting the Muse with Ruth Kozak, Kitsilano Highschool, Vancouver BC. May 28, 2006: Connections (for teens), The Vancouver Public Library. July 9, 2005: The West Coast Poetry Festival. July 5, 2005: Teen's Poetry Workshop, Ocean Park Library, Surrey BC. Feb. 6, 2005: Port Moody Arts Centre, The Path to Poetry (adults). August 9 – 13, 2004: (10 workshops) Vancouver Public Library's Summer Book Camp. July 15, 2004: Mount Pleasant Library/Kingsgate Mall, children's workshop. April 24, 2004: West Vancouver Public Library (adults). March 4, 2004: Kitsilano Library, The Path to Poetry (adults). August 24, 2003: Richmond Public Library (teens). August 18th – 27, 2003: (10 workshops) Vancouver Public Library's Summer Book Camp. Nov 15, 2014: Midnight in Paris: A Gala Fundraiser to Support Pandora’s Collective’s Outreach Program at the BC Children’s Hospital Eating Disorder Clinic, Vancouver. 2008 - 2011: Lunch Hour Series. South Lands Elementary School. Feb 21, 2008: Thunderbird Elementary School, Vancouver BC. Oct 25, 2007- Feb 2008: ​Sir Charles Tupper High School, noon hour workshops. Dec 5, 2007: Power Program, youth workshop, New Westminster BC. June 2007: Southlands Elementary School, Vancouver BC. May 30, 2007: Power Program, youth workshop, New Westminster BC. Oct 25, 2006: Artstarts, Vancouver. July 10 & 17, 2006: YWCA, youth workshops. ​June 5, 2004 - 2006: Aurora Drug and Alcohol Treatment Centre. April 20, 2006: "Wonder of Words", Hastings School, Vancouver BC. April 11, 2006: Argyle Secondary School, Grade 12 Writers Retreat @ Bowen Lodge by the Sea. March 3, 2006: (2 workshops) Vancouver Technical Secondary School. ​December, 2005: Open Mic and Collection of books for Zimbabwe @ The Cottage Bistro. July 12 & 29, 2005: YWCA, youth workshops. May 25, 2004: Carnarvon Community School, Vancouver BC. May 22, 2004: SOS Children's Village/YMCA, Vancouver BC. April 20, 2004: Mount Pleasant Elementary School, Vancouver BC. April 6, 2004: (5 workshops) Strathcona School, Vancouver BC. April 1, 2004: "Wonder of Words", Hastings School, Vancouver BC. March 26, 2004: (2 workshops) Eric Hamber Secondary School, Vancouver BC. December 17, 2003: Covenant House, adult workshop. May 2 & September 26, 2003: Carnarvon Community School, Vancouver BC. November 6, 2003: Pandora's Collective Writers’ Scholarship Fundraiser at the Coppertank Bar and Grill, West Broadway, Vancouver BC. April 17, 2003: MB Stanford Elementary School, Surrey BC. April 17, 2003: Colebrook Elementary School, Surrey BC. February 25, 2003: Princess Margaret Secondary School, Surrey, BC. March 20, 2016: Pandora’s Collective featured at The Spring Equinox Coffee House, The Al Mattison Lounge, Britannia Community Centre, Vancouder. April 14, 2012: Poetry Around the World, Renfrew Public Library, Vancouver BC. April 14th, 2011: Pandora’s Collective at Poetry Around the World, Renfrew Public Library. Feb 16, 2010: Spoken INK, the Burnaby Writers’ Society's public reading series. April 27, 2009: World Poetry Reading Series, Vancouver BC. Feb 1, 2009: Tempestuous Words and Lush Images art and poetry show, Vancouver BC. Nov 14, 2008: Other World, Victoria Drive Community Hall. May 21, 2007: Revision Reading Series, Vancouver, BC. Nov 1, 2007: Telling Tales, Bowen Island. Sept 30, 2007: Word on the Street. May 8, 2007: Blue Moon Reading Series, Clearbrooke Library, Abbotsford BC. April 11, 2007: Pandora's Collective feature for National Poetry Month, Poetry Around the World, Indigo Books, West Vancouver BC. Feb 23, 2007: The World Poetry Gala Celebration, Vancouver Public Library, Vancouver BC. Feb 2, 2007: First Friday Coffee House, Java Express, Vancouver BC. Oct 23, 2006: International Library Day, Leo Marshall Curriculum Centre, North Vancouver. Sept 13, 2006: Poetry Around the World, Indigo Books, North Vancouver. Jully 11, 2006: Blue Moon Reading Series, Abbotsford BC. June 27, 2006: Vancouver Peace Forum, Vancouver BC. March 7, 2006: First Tuesday Assembly of Poets, Chapters, Robson Street, Vancouver BC. August 26, 2005: VanDusen Botanical Garden, Vancouver BC. July 23, 2005: The Summer Dream Reading Festival. April 16, 2005: Battered Souls, The William Davis Centre, Vancouver BC. April 5, 2005: First Tuesday Assembly of Poets, Chapters, Robson Street, Vancouver BC. 2004: Under the Elephant, Vancouver BC. December 13, 2004: World Poetry Reading Series, Vancouver BC. Aug 7, 2004: The Poet's Corner at the Roundhouse Community Centre. June 13, 2004: City Fest/The World Poetry Reading Series, Vancouver, BC. April 24, 2004: North Shore Writers Festival, West Vancouver Library. February 18 & April 21, 2004: Poets Nuit, Vancouver BC. March 26, 2004: Final Fridays, Vancouver BC. March 21, 2004: Thundering Word Heard, Vancouver BC. Jan 18, 2004: Literatura, Vancouver BC. August 9, 2003: The Poet's Corner at the Roundhouse Community Centre. August 5, 2003: First Tuesday Assembly of Poets, Chapters, Robson St. location, Vancouver BC. July 14, 2003: World Poetry Reading Series, Vancouver BC. 2003: Spoken Revelation, Vancouver BC. ​June 2012 - 2016: Annual Soirée, Vancouver BC. June 18, 2011: Soirée, Vancouver BC. June 19, 2010: Soirée, Vancouver BC. Dec 5, 2009: Soirée, Vancouver BC. Aug 29, 2009: Soirée, Vancouver BC. June 21, 2008: Soirée, Vancouver BC. Dec 31, 2007: Soirée, Vancouver BC. Dec 21, 2007: Christmas Caroling, Vancouver BC. Nov 30, 2007: Soirée, Vancouver BC. March 24, 2007: Soirée, Vancouver BC. Sept 1, 2006: Soirée, Vancouver BC. June 17, 2006: Soirée, Vancouver BC. March 18, 2016: Soirée, Vancouver BC. Feb 15, 2006: Soirée, Vancouver BC. December 31, 2005; Soirée, Vancouver BC. October 17, 2005: Soirée, Vancouver BC. September 3, 2005: Soirée, Vancouver BC. May 21, 2005: Soirée; Vancouver BC. April 9-10, 2005: Pandora's Collective Writers Retreat, Sechelt BC. December 31, 2004: Soirée, Vancouver BC. ​Oct 6, 2008: Franklin Elementary raised $134.00 for our Lonnie Backpack Drive which provides backpacks and financial aid to children in Zimbabwe in collaboration with Connie Linder of Insight Creative Communications, Doug Ante of Rotary International. June, 2008: Southlands Elementary School raised $309 for our Loonie Backpack Drive. This money will help Doug Ante of Rotary International to provide school supplies (for an entire year) for the orphaned children that he works with in Zimbabwe. Oct, 2007: Ilana Sigal, our teen poetry contest winner has donated her winnings of $105 to the Pandora's Loonie Backpack Drive. Connie Linder of Insight Creative Communications has matched the funds. This will send an orphaned child to school for a 1 year in Zimbabwe. 2007: Army & Navy donated 11 backpacks and Southlands Elementary School donanted $202.25 to our Loonie Backpack Drive. Through the care of Connie Linder of Insight Creative Communications and Doug Ante of Rotary International this money was used to purchase notebooks for the children already in the school in the community where Doug is situated in Zimbabwe. March 23, 2006: Thanks to our volunteers Pandora's Collective was able to collect, package and ship an estimated 33,000 books to Zimbabwe in collaboration with Connie Linder of Insight Creative Communications, Doug Ante of Rotary International and The Vancouver Public Library. 2015: Bonnie Nish was nominated for the YWCA Women of Distinction Award in "Arts, Culture and Design". 2014: Sita Carboni received the Community/Literary Ambassador Award from the Writers International Network. 2013: Bonnie Nish received the "People’s Laureate Award and the Dr. Asha Bhargava Memorial Award from the Writers International Network. July 14, 2003: Certificate of Appreciation from the World Poetry Reading Series and Radio Show, Vancouver BC. Oct 2016: Pandora's Collective features on Chimp. June 2016: Vancouver Blog: “Peerings & Hearings” in Drunken Boat mentions Pandora's Collective. April 2016: "Halder Hero Bonnie Nish, Vancouver Canada" by Genevieve Anne for Halder PR. ​2010: Truman Fulton-McLean, who happens to be Warren Dean Fulton’s son, was interviewed by the Province. Nov 6, 2009: Jewish Independent, "A spoken word night" by David J Litvak. - Megaphone Magazine, "Literary Libation, Summer Dream Literary Arts Fest brings community together", by Kevin Hollet. Aug 2009: Commercial Drive Live, Steve Duncan interviews Bonnie Nish and Rhonda Milne regarding the 6th annual Summer Dream Literary Arts Festival. Feb 20, 2009: Jewish Independent, "Moved to poetry by artwork" by Eric O'Donnell. Nov 21, 2008: Jewish Independent, "Moved to Write Poetry" by Olga Livshin. March 28, 2008: South Delta Leader, "Painting meets Poetry" by reporter Kristie Thiessen. Feb 28, 2008: The Voice, "Writers Whip Up Words" by Saffron Hystad. July 2007: Strange Places, "Promoting the Arts That Inspire the Worls to Take Notice of Itself" by Daniela Elza. 2007: Tricity News, "Poets Gather for Blue Moon Reading Series" by Shelley haggard. April 5, 2007: Commercial Drive Live, "Literary: Acclaimed Lau Hits Twisted Poet Stage" by S.R. Duncan. August 3, 2005: The Vancouver Courier, "Monthly gathering helps whip words into shape" by Emily Kendy. July 21, 2005: The Georgia Straight, "Choice of the Week" by John Burns. April 13, 2005; The Burnaby Now, "Poetry workshop at the cafe". November 2004: The Federation Vox. August 2004: The Federation Vox, "First Annual Summer Dream Reading Festival". August 12, 2004: The WestEnder, "Lyle got his wires crossed in column". August 5, 2004: The Vancouver Courier, "Word Up". July 29, 2004: The WestEnder, "Stoners and serious converge at lit fest". March 3, 2004: The WestEnder, "A collective breath of fresh air on Robson". June 28, 2003: The Vancouver Sun, - "Program bolsters school-age literary talent".